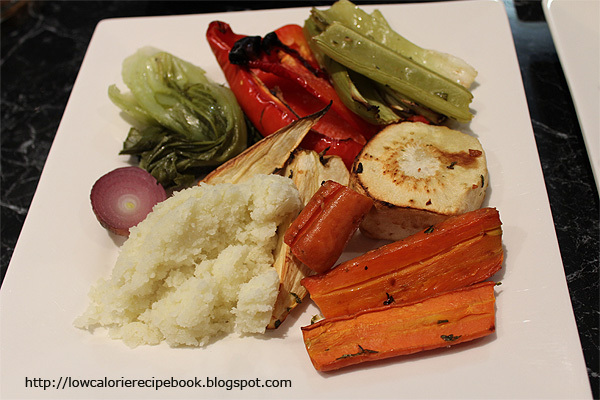 Prepare vegetables in pieces that will cook at the approximately same time in an oven (except cauliflower). The Bok Choy and celery with be cooked in foil. On a sheet of foil, lightly sprayed with olive oil place celery. Lightly spray celery and season with salt and pepper. Seal tightly adding extra layer of foil if needed. Repeat foil process for the Bok Choy and place celery and Bok Choy in oven. Process Cauliflower in food processor and place in microwave proof bowl fitted with a lid. Microwave 6 minutes on high just before serving roasted vegetables. Place on oven tray. Cook vegetable until well roasted. Prepare dressing and drizzle over vegetables once plated. Sprinkle with extra sea salt flakes if desired.